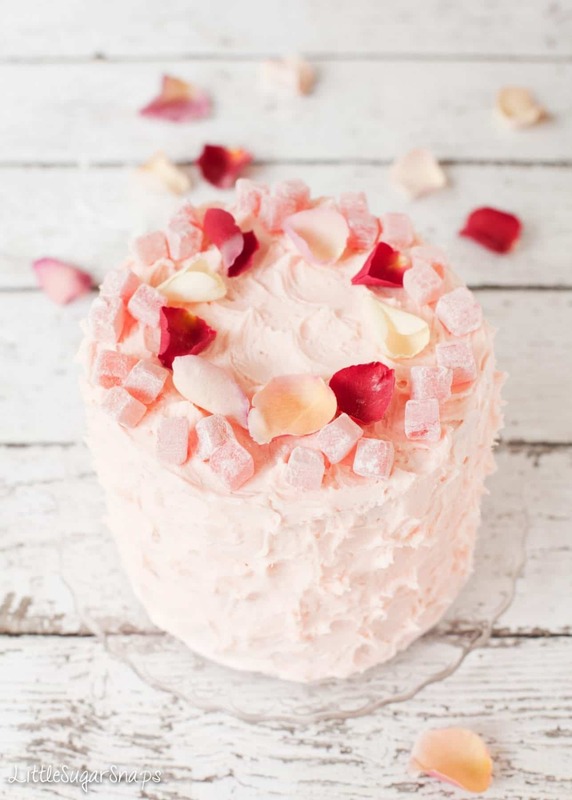 Layers of lemon and rose cake, a subtle rose buttercream & chunks of Turkish Delight and rose petals to garnish. 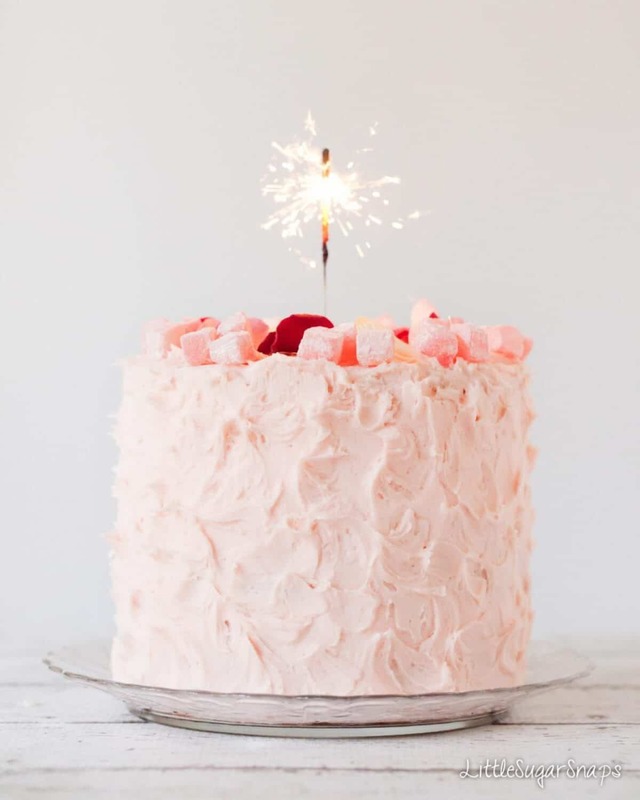 This Turkish Delight Cake is a beautiful celebration cake. Today’s post is all about cake. I’ve baked a lot of cake in the last month and can confirm that this Turkish Delight Cake was my favourite. 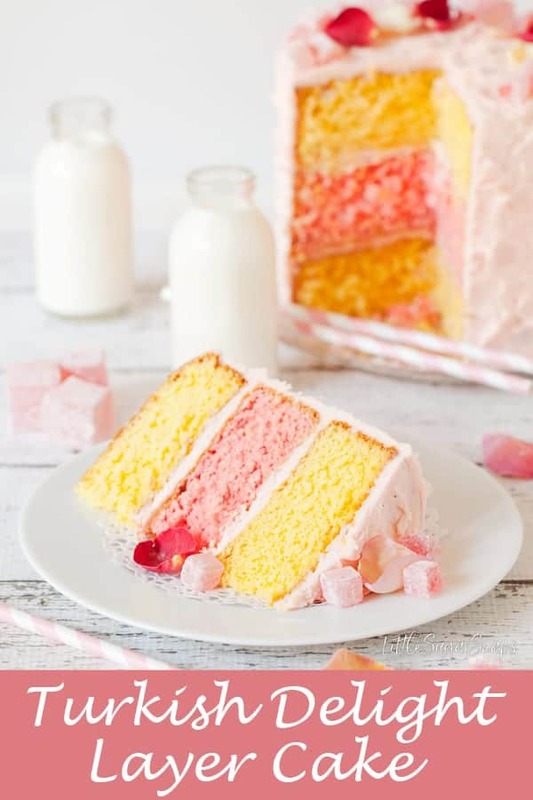 It has the flavours of rose and lemon in the layers of cake, a subtle rose icing and is topped with small chunks of Turkish Delight & edible rose petals. It’s enough to satisfy the sweet tooth of a child but not so sweet it would offend more mature taste-buds. March is my busy month for baking celebration cakes. My girls have their birthdays just 8 days apart and both usually end up having their party on a day that is not their birthday. That’s 2 cakes each: one for their party, one for their actual birthday. That makes me either a total sucker (√) or a big softie who cannot bear the thought of not baking a cake for them on their actual birthdays (√√). Either way, by the time the candles on that 4th cake have been blown out, you can guarantee that I’m normally looking slightly green at the thought of putting another pile of themed birthday cake (usually covered in garish coloured icing) onto my plate. This year both girls decided on a piñata cake for one of their cakes. Yes, those cakes that you top with piles of sweets, then cover with a perfectly molded chocolate dome for your child to thwack with something heavy. I do sometimes wonder if they just like to challenge me. However, I agreed (sighing inwardly at the task that lay ahead). Milly got her cake exactly as specified. A week later, feeling confident, I decided to stash the cake and dome for Hannah’s party safely in the lounge, planning to decorate the dome with M&Ms later on. I gave the girls strict instructions not to bounce that jetball they were playing with anywhere near them. I think you can guess the rest… A few minutes later, one very sorry little sister confessed that she’d had a ‘slight accident’ with the chocolate dome and a certain ball…. Laugh? Cry? This tale does have a happy ending, I promise. Expecting to find the entire dome shattered, I took a look. By some miracle the ball had gone straight through, leaving a large – as in 5cm diameter – hole. But the dome was still standing. Hoorah. What luck. Erm…. After getting Hannah to see the funny side, which took all of 5 seconds, I set about hiding that hole with the aid of a Tunnocks snowball (nose), two mini Jammie Dodgers (eyes) and some decidedly dubious red gel icing (mouth). Han was more than thrilled – M&Ms and a cheeky face. Anyway, back to today’s cake. Fortunately for me, Hannah – who the 4th & final cake of my annual cake-athon is destined for – has, for the last 2 years let me surprise her with proper cakes for her actual birthday. Last year I made the most enormous caramel apple layer cake imaginable. It contained not one scrap of icing, just caramel on the scale of a volcanic eruption. It was marvellous. This year I made something much more personal, based on her middle name, Rose, and the fact that she’s still young, so therefore likes sweets, pink and all things pretty. 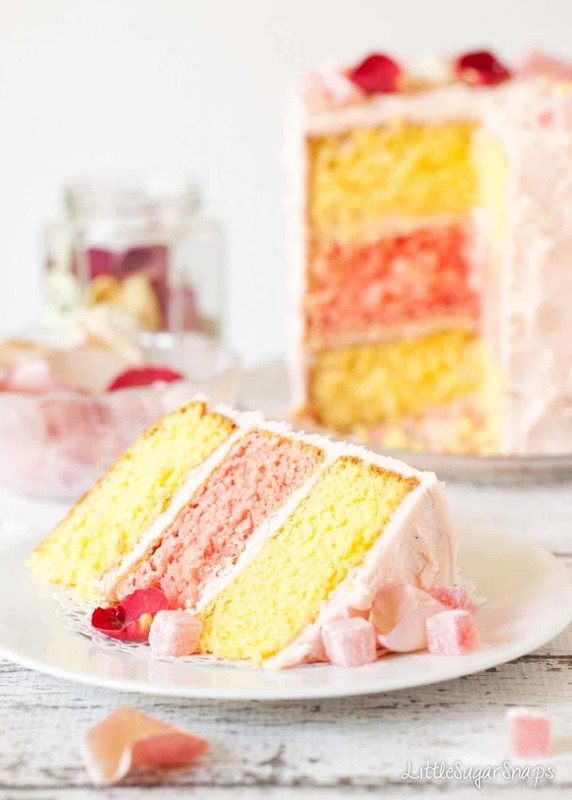 The Turkish Delight Cake (aka Lemon and Rose Layer Cake). I was going to give you a recipe for making your own Turkish Delight, but truth be told, it went horribly wrong. Not even a snowball could fix it. I did, however, learn that Turkish Delight is veggie friendly. It’s made using starch and sugar, not gelatin as I had always assumed. However, I do heartily recommend popping down to the supermarket to buy some. Unless, of course, you have Turkish Delight making down to a fine art. Happy Belated Birthday to Milly & Hannah! Glad to hear there was a happy ending (cause I know how upsetting that experience could’ve turned out). This Turkish Delight Layer cake is the essence of Spring: it is light, features soft colors, a beautiful petals. I would love to enjoy a slice right now. Thank you so much. This particular birthday year will be one for them to remember! Is this a recipe from the country Turkey? I am trying to find a recipe for one of my employee’s birthday. Thank you! Hi Sabrina, I’m afraid it’s not a Turkish recipe, it is based on the common flavours of Turkish Delight, rose and lemon. However, since it is decorated with Turkish Delight maybe it could pass if all else fails…. Good luck on your search. Ahhh such a beautiful cake! Love the colors in here 🙂 I’m sure it’s delicious too! Hello – Belated congratulations on your birthday! What a gorgeous cake. Your photos really show it at its best, and reading the ingredients, it seems like it would have a delicate taste. What an interesting combination – lemon and rose! That is what I though the first time I saw the recipe for basil mint cake in the blog called Chasing Delicious. 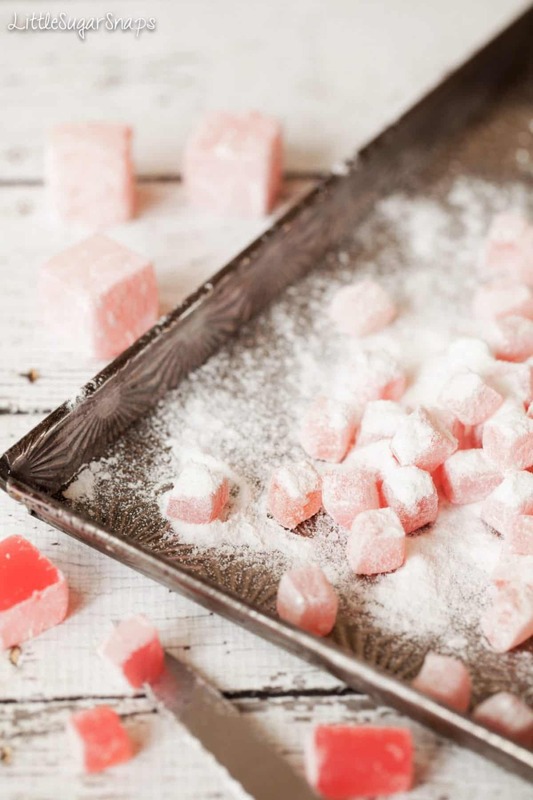 I am an American, but I have been living in Istanbul for the last 7 years, and I have never seen such a creative idea – to top a cake with lokum, the word locals use for Turkish delight. I would like to bake this as you have described it, but I have no idea where to find edible roses or flowers of any kind. I will appeal to those who follow a local Facebook page – Cook`s Corner for Ex-pats in Turkey. Wish me luck! It was very kind of you to share this, recipe and superb photos. Thankyou so much for your comments. I hope you do get to enjoy this cake in all it’s glory. 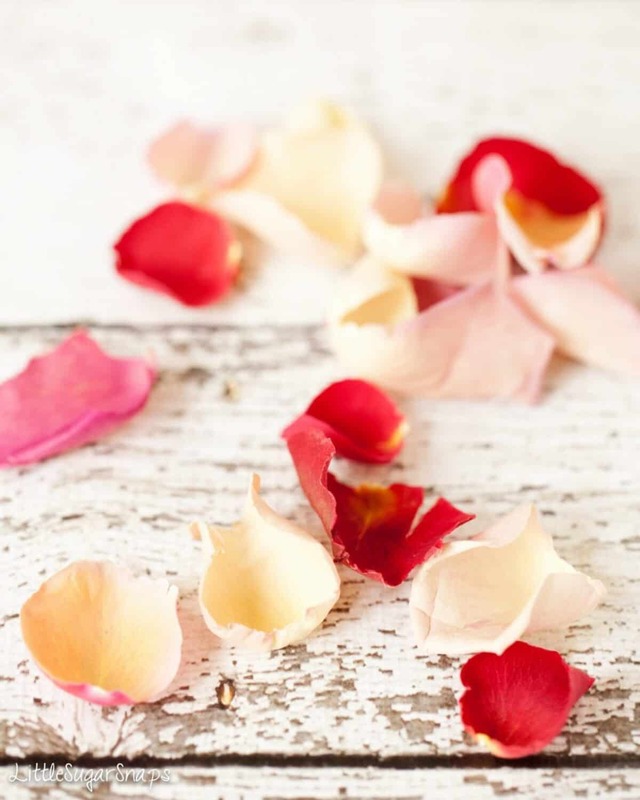 If you struggle to get hold of any edible rose petals you could just add a little extra Turkish Delight (yum) – a mix of pink shades or a splash of yellow would look lovely. I like the sound of the basil & mint cake – I’m on my way to check it out now! Jane, this cake is just so gorgeous! Also I think you do get mom of the year for making so many cakes for your girls. It’s something they will always remember fondly, I’m sure! Loving the turkish delight flavors here too, so creative and SO PRETTY! Love the decorations and the colorful layers! SO fun! This cake is absolutely stunning, Jane! LOVE it! Shared on my FB page! Hi Annie. I’m so pleased you like this cake – it’s very special. I’d love to tell you that it would be fine a few days after baking, but I have a few reservations. It will definitely not be as fresh – with no preservatives, homebakes do tend to be at their best within the first 1-2 days of baking. I’d say 48 hours later would just about be ok, but it will definitely not be as moist as it would be if eaten earlier and you’ll need to eat it up quickly over the next couple of days. Regarding storage, since there is soft cheese in the frosting, you’ll need to chill the frosted cake in the fridge and bring to room temperature before serving. Also, do not put the final decorations on (edible rose petals, Turkish Delight) until it has come back to room temperature, otherwise the cool temperatures will get to them. I hope I haven’t put you off. Surprises are so tricky to keep that way sometimes, but worth the effort. Could you borrow a neighbour’s kitchen? hi , i hope this thread is still open i am looking forward to making this for my mom this year for mothers day however i am just after your opinion to be honest. 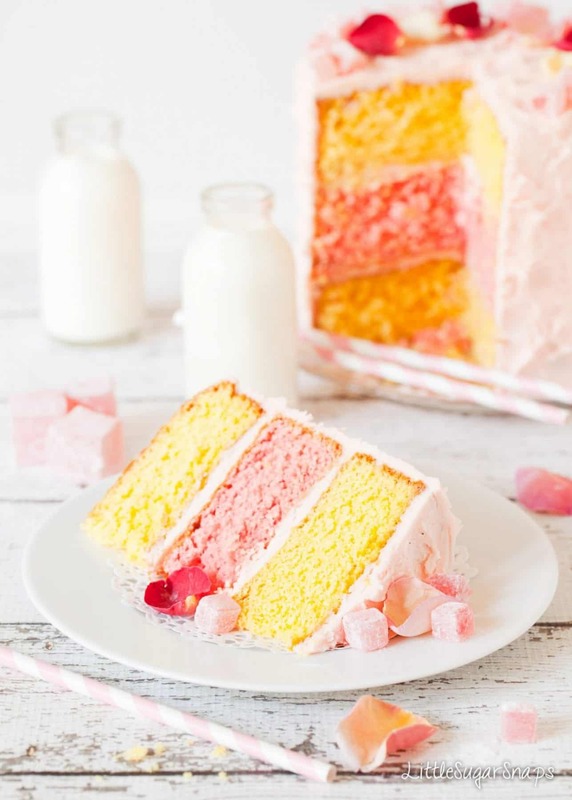 i would like to bake this cake however i have found turkish delight icing sugar would i be able to create a drip cake on this cake using turkish delight icing please? Gosh, that’s a new one on me. However, doesn’t it sound delicious. This cake is a sponge cake, so it would withstand Glacé icing in place of the buttercream. When mixing the icing sugar with water just ensure the icing is not mixed too thin since it would just soak into the cake. I hope you enjoy it. This cake looks so elegant and delicious! I love how the layers are coloured differently and how you decorated the cake with rose petals!